The global equity rebound continued Monday in Asia after U.S. stocks rallied Friday on a solid April jobs report. The gains were led by China, where indexes rose by more than 1% despite a lack of progress on trade talks with the U.S.
China’s gains helped push up Hong Kong’s benchmark index HSI, +0.42% by 0.5% and a measure of Chinese stocks traded there by 1%. The Hang Seng Index has underperformed amid worries about the city’s interest rates and the Hong Kong dollar, with the index falling in six of the previous seven weeks. Ping An Healthcare 1833, -6.93% continued to struggle after its debut on Friday, when it had the worst performance among major tech IPOs globally since October 2015. The stock was down 5.8% at midday. Commodities stocks helped Asian equities reverse Friday’s broad selling, which was led by weakness in financial shares. The U.S. oil benchmark CLM8, +1.02% topped $70 a barrel for the first time since late 2014 on Monday, rising 1% alongside a similar increase in the Brent LCON8, +1.10% global standard. Several stock indexes in the region were up by at least 0.5%, with Indonesia’s benchmark up 1% after a selloff on Friday amid broader emerging-market concerns. S&P 500 futures ESM8, +0.26% , which jumped 1.3% Friday, were recently up 0.3%. Malaysia’s stock index fell an additional 0.7% ahead of Wednesday’s national election. In Japan, stocks were hurt by a stronger yen. 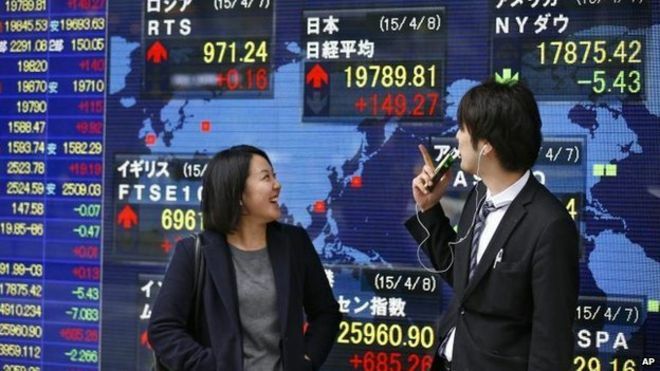 The Nikkei Stock Average NIK, -0.03% fell 0.1% as the market reopened after a four-day weekend. Bitcoin BTCUSD, -1.58% has continued to pull back from its latest attempt to hit $10,000 for the first time in two months. It was recently around $9,250, according to CoinDesk.